When left untreated, oral bacteria can penetrate into the interior of a tooth and lead to a range of issues. Dr. Jon Marc Van Slate performs root canal therapy at his Houston, TX, practice to restore oral health and prevent tooth loss or the need for tooth extraction. Dr. Van Slate uses a gentle touch and an innovative form of local anesthesia delivery to ensure the comfort of patients during root canal procedures. In addition, he also offers oral-conscious sedation for those who are particularly nervous about treatment. Contact our practice today to schedule an appointment and learn more. The collection of connective tissues, blood vessels, and nerves inside of a tooth is referred to as the pulp. 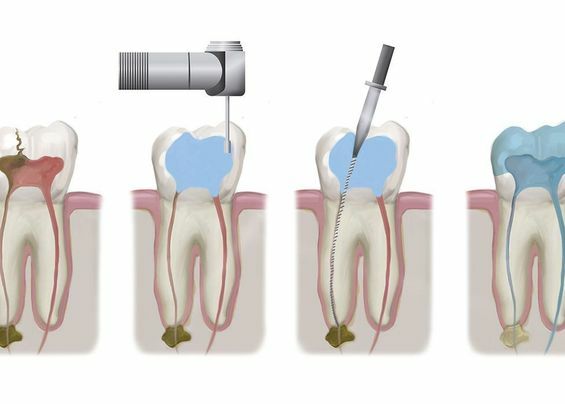 The pulp is located within a chamber known as a root canal. When oral bacteria is allowed to build up on the surface of a tooth, it can slowly erode enamel and eventually spread to the pulp. As an infection develops, the patient can experience noticeable discomfort that ranges from dull and intermittent aching to sharp and consistent pain. Root canal therapy is used as a trusted way to eliminate an infection, preserve the health of a tooth, and prevent additional damage. If the infection is not properly treated, it can spread to surrounding tissues or enter the blood stream and contribute to other health problems. Root canal therapy offers several benefits. It is used as a trusted way to eliminate an infection, preserve the health of a tooth, and prevent additional damage. If you think you may have a tooth infection, we can perform a thorough diagnosis with the help of digital dental x-rays. Before beginning a root canal procedure, Dr. Van Slate will explain what to expect and answer any questions you may have. Although most patients find local anesthesia to be sufficient, we also offer oral-conscious sedation for individuals who suffer from dental anxiety. Dr. Van Slate will begin by using the Anutra Local Anesthetic Delivery System to numb the treatment area. This advanced device buffers anesthesia, which is a chemical process that neutralizes its ph level. When compared to using a traditional syringe, the Anutra system allows for minimal pain during an injection and patients typically become numb more quickly. Once you are at ease, Dr. Van Slate will create a small opening at the top of your tooth to access its root canals. Using special tools, he will remove infected portions before sterilizing the area. The resulting space within your tooth will then be filled in with a rubber-like paste. After undergoing root canal therapy, we typically recommend receiving a dental crown — which is a tooth-shaped cap — to provide protection and structural reinforcement to your treated tooth. Many patients have a fear that root canal therapy will be a highly unpleasant experience. Fortunately, advances in anesthesia and dentistry techniques have enabled dentists to perform root canal treatments with minimal discomfort. Many patients compare the procedure to the process of receiving a dental filling. To schedule a root canal consultation with Dr. Van Slate, reach out to our practice today.